Updated: Arrest made today. Amanda Prestigiacomo for The Daily Wire Thursday sourced a former Navy explosive ordnance disposal (EOD) officer Tom Sauer in a Twitter thread on the packages sent to prominent Democrats. 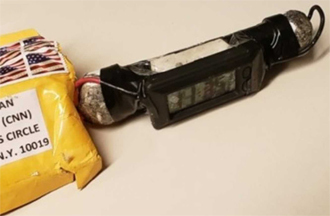 According to Sauer, it’s extremely likely the packages were meant to be intercepted and cause political damage, as opposed to an attempt to harm the targets. In his viral thread, Sauer made note of some of the red flags that support his assessment. Sauer also noted that the size and setup of the device struck him as odd. “You can find timers / remote control receivers WAY smaller than whatever that white box is. A proper timer would best be stored inside the pipe, making it fully encapsulated. That thing is just silly looking,” he wrote. Click here for more of the story on The Daily Wire. 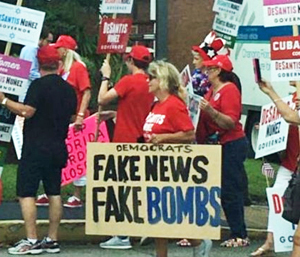 Update: Suspect arrested in Florida in connection with suspicious packages sent to Democrats, click here for more from Fox News. This entry was posted in National on October 26, 2018 by admin.